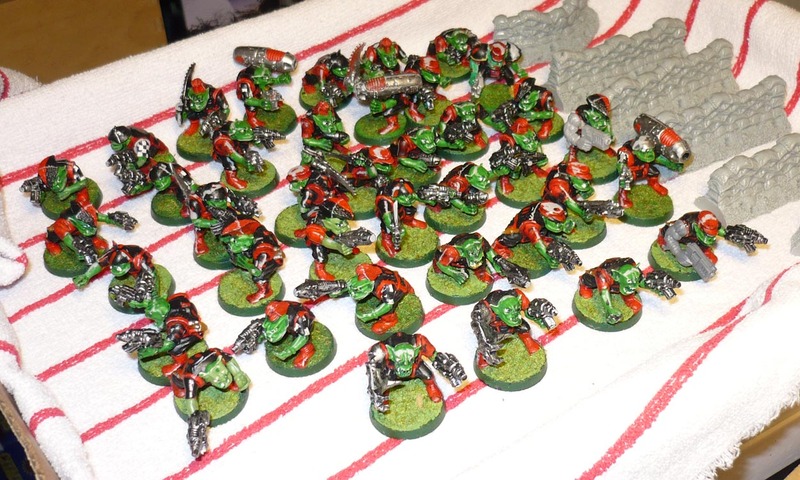 The Challenge: Salvage this group of 39 Rouge Trader Space Orks I recently bought of ebay for less than the price of a pint of beer, to a decent table top standard. Speed is of the essence. I will not be spending hours on these, and they will certainly not be golden demon material when finished. But they will be much, much better! I will probably be dipping them at some point, as I do have some dip left and do not seem to be using that stuff any more. They are really not that badly painted, if it was by an eight year old who only recently got into painting that is. 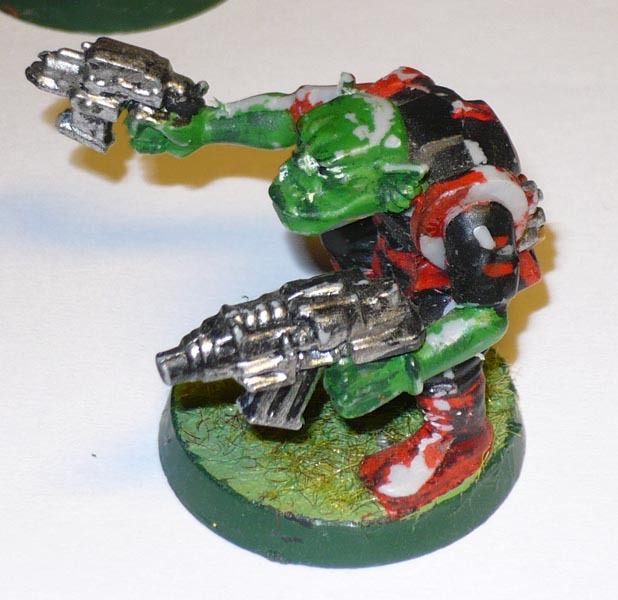 Space Orks are a horde army. So you need buttloads of them to make any headway. Here is a buttload. 39 of them. Preamble: skip this if you think it is too wordy. Most of my own old shite is not salvageable, due to the fact I used a far too thick coat of high gloss varnish on most of them….it is almost as if they are encased in carbonite. I do not have the patience to even try to strip them. However, I have to date made a number of purchases of second hand miniatures off Ebay. 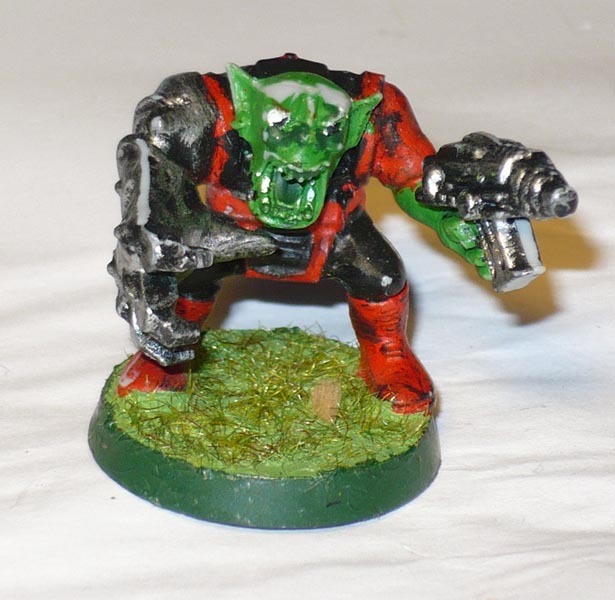 I generally try to avoid buying painted minis, for obvious reasons, but every now and then there comes along what seems like a good bargain for some sort of group or squad for my Space Ork or Skaven army or whatever that I bid a low amout for. Sometimes I end up winning the bid. Even when paying just a few pounds, most often even this price seems too high for what I get. One would think I would take the hint when there are no good close up pictures of them, and when most descriptions say “well painted” that is usually a lie. Maybe most sellers simply are stating their honest opinions. In which case they must have really low standards. Also it seems most no-one ever cares to clean off mouldlines. So basically, what I end up getting is what I would normally would consider chucking in the scrapheap. But I try to salvage them, if I can. For example, most of my Skaven clanrats purchased in this manner have been repaired, totally repainted and are now sitting pretty, hidden deep in the rank and file with their fellows. With a quick and dodgy repaint, they come to life and are servicable. 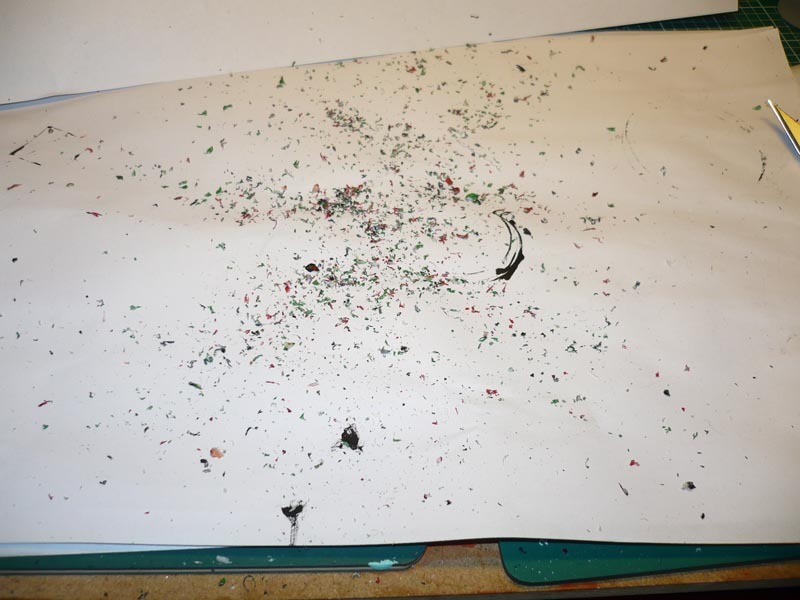 At least at a distance….This is what we call “speed painting to a table top standard”. Day 1: Getting to grips with the Rouge Trader Space Orks. I do not have all that much hobby time, so this plog will not be daily. “Day #” refers to the sequential day that I got to work on them. But wey-hey! 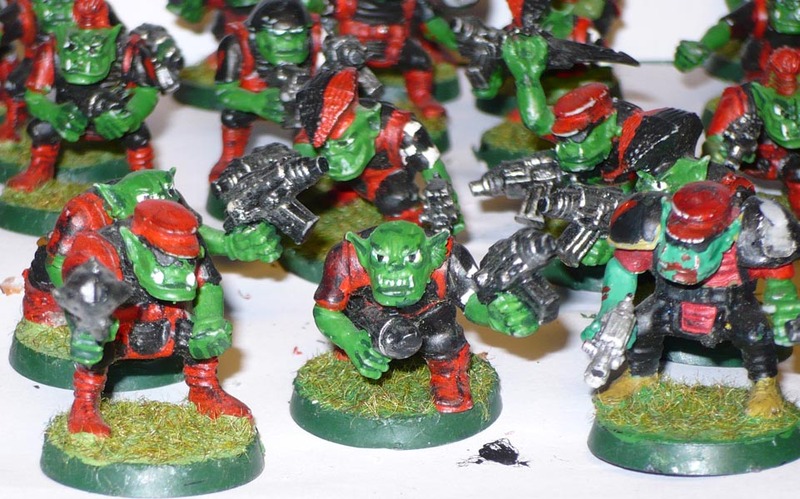 39 Orks! A sizable sqaud of boys in anyone’s book. Once upon a time I had some of these early plastics from Citadel. However I can no longer find them, and I expect they are lost. They are fun figures, not as comical as the 3rd editon orks, nor as brutal looking as the more recent orks. They will do the job when salvaged. The minis I got had all the signs of young, but enthusiastic painter. They are all fully based with static grass, done in Goff red and black, classic green skin and and some black and white checkerd patterns here and there. The paint is caked on in places and mostly but not quite within their borders -imprecise. Maybe some sort of shading or thinned black has been used in patches on the red. The models themselves have been glued together without too much thought on posing or how the weapons are carried. At least there is not a lot of visible glue residue. I expect thin solvent glue has been used. Not at all a bad base to start from…apart from the mould lines! GOD! I HATE THOSE MOULD LINES! So I had to spend som time cleaning them up, scraping off all the mould lines from hell. At least this plastic is really easy to scrape. Also a few loose arms and guns needed gluing on here and there, inclcuding a couple of replacement recent Ork arms from my bits box. Offcut mould lines and other leftovers after the work was done. How much had to be cut off? All the grey is bare plastic. I also could not fail to notice that these figures were dirty. Dust, greasy residue, bits of fluff and hair. What have you. Thats 20 years or more of build up for you. Into the hot soapy water for a good scrub they all go. All ranked up and good to go. The grey bits to the right are a set of resin VOID sandbag walls I dug up out of storage the other day. However, because of the large amount of mould line removal, this project is much more likely to be more of a repaint than just an E.R. as most surfaces has lost much of their paint. Tomorrow I will try to fix one up to see what needs to be done.